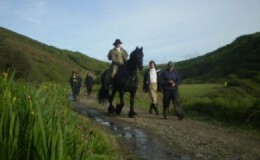 During May 2007 the BBC spent three weeks on the Hartland Abbey Estate in North Devon filming Andrew Davis’s adaptation of Jane Austen’s ‘Sense and Sensibility’. A 15th century cottage on the coast was the setting for Barton Cottage to which Mrs Dashwood moved with her three daughters on the death of her husband. The BBC spent two weeks setting up and a horrendously wet week filming. The film was shown in three parts, the first commencing on New Year’s Day on BBC1. It boasts a wonderful, young and glamorous cast in some stunning scenery. Anyone familiar with the beauty of the Coastal Footpath between Hartland Quay and Hartland Point will recognise the setting, but the BBC made some very clever changes to the exterior of the cottage so not everyone will recognise it! Only a year before, the Art Director had been walking the footpath with his young family and had vowed one day to use the cottage for a film; he couldn’t believe it when he was sent there by the location manager for Sense and Sensibility so soon afterwards! Visitors to Hartland Abbey during the May were treated to some memorable sights, despite the awful weather. The unit base filled the whole car park and visitors were constantly bumping into actors and actresses in period costume wandering round the house and gardens or buying ice creams. 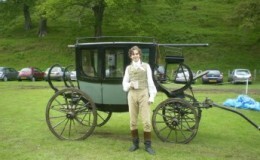 Coachmen drove gleaming horses and carriages, with perfectly balanced luggage on top, back and forth to the cottage. It felt as though the Abbey was again back in the 19th century! Janet McTeer (Mrs Dashwood), Hattie Morahan (Elinor) Charity Wakefield (Marianne) Dan Stevens (Edward Ferrars) Dominic Cooper (Willoughby) David Morrisey (Colonel Brandon) and Mark Williams (Sir Edward Middleton) star. Coincidentally Hattie Morahan’s father, Christopher, the film director, had spent a year at Hartland Abbey in the war when evacuated there with Highgate Junior School! Visitors to Hartland Abbey are able to walk to the cottage and the Atlantic cove. In spring the woodland walk is carpeted in wild flowers. 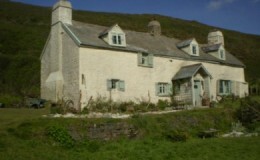 The cottage is also available for holiday lets (Holiday Cottages). e-mail: Hugh or Angela Stucley.